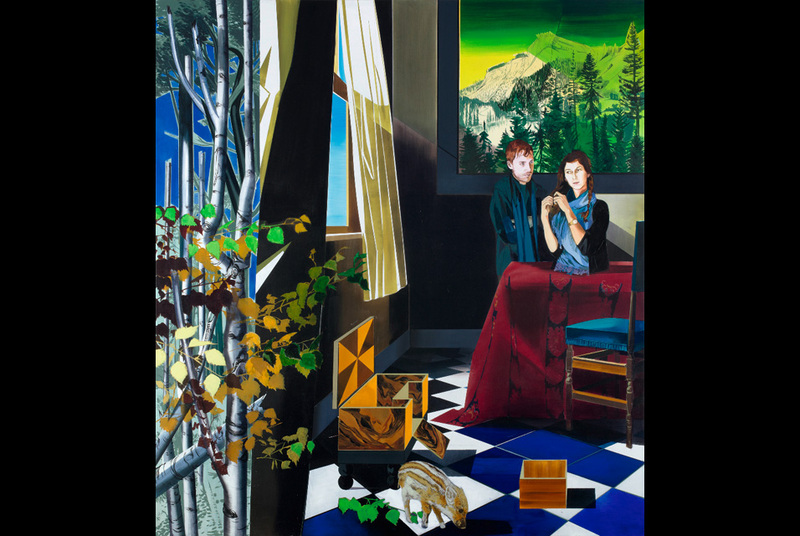 Susanne Kühn, The Couple (Das Paar) 2011, acrylic on canvas, 250 x 5 x 230 cm, © Susanne Kühn, Courtesy Haunch of Venison. LONDON.- German artist Susanne Kuhn's first exhibition with Haunch of Venison introduces the artist's innovative blend of realistic light effects, fantastic architecture and figuration. Opening in February 2011, the exhibition will feature new work including paintings of landscapes and unsettling domestic interiors. Having studied at the renowned Hochschule fur Grafik und Buchkunst (Academy of Visual Arts) in Leipzig where she received classical training in painting and drawing, Kuhn moved to the US shortly after her graduation. She completed postgraduate studies at the School of Visual Arts and Hunter College in New York followed by a Radcliffe Fellowship at Harvard University. Her experience of living in America coupled with her academic background from Leipzig makes Kuhn's paintings unique and different from her colleagues from Germany. suggest fanciful worlds, private and closed in many ways yet broadly resonant and open to a range of interpretations.The show will feature a sequence of paintings depicting domestic interiors and landscapes which are on the threshold of nature and urbanism. These series of works 'Garden Eden' (2010), 'The Flood' (2010), 'The Couple' (2011), 'Portrait of a young man' (2009) illustrate Kuhn's exploration of borders, thresholds and intersections challenging traditional perceptions of painting while adding a peculiar quality of compositional movement and of animation. A signature characteristic of Kuhn's work is the investigation of Northern Romantic tradition through the influences of sources like The Hudson River School or the photographs by Ansel Adams. At a glance her works resemble the paintings of Caspar David Friedrich, in Black + White Landscape on Wall (2010) and Mountains on photo (2010), Kuhn composes a towering landscape of cypress trees, pines, and willows in woods, altering the Romantic atmosphere with a vaguely ominous contemporary insinuation. Baltimore Museum of Art Exhibits Never Before Shown Images in "Seeing Now: Photography Since 1960"